The Hurricane Ultra II ULV mister is an electric portable aerosol applicator that dispenses both oil and water-based products. 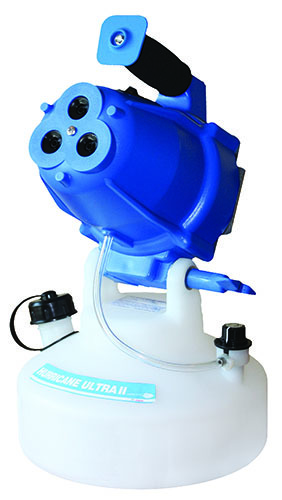 The Hurricane Ultra II is ideal for use in spraying industrial and residential areas. Farms, greenhouses, warehouses,animal care facilities, sanitation, germicidal spraying and disease control programs are just a few of the markets where the Hurricane Ultra II is used. • Rugged design handles corrosive liquids and heavy impacts. • Low profile tank design virtually eliminates tipping…empty or full! • Droplet sizes can be controlled for both ULV spraying and residual spraying. • Hurricane Ultra II will replace the Hurricane, Hurricane Ultra, Sanitizer and Anileator. Anileator orifice kit must be purchased separately and installed. Anileator orifice kit part # 62234. The “Birds” maintain the best fogging rate in its class with a formulation control valve that is simple and accurate to operate. Blue Bird and Red Bird are unique machines that have the best weight to performance characteristics in the market. Each feature an extremely reliable automatic rechargeable battery that enables easy and multiple start-ups before recharging. 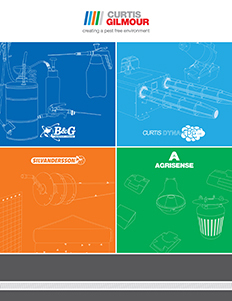 The balanced, ergonomic and lightweight design allows for prolonged carrying of the machine reducing operator fatigue. Should the need arise, the Blue Bird and Red Bird mechanical design enables easy in the field maintenance by the operator.